Sometimes, I only find out when my assumptions are proven wrong in the lab. When this happens, a lot of time and money gets wasted in reworking the design to follow the way things actually work. For the most part, I charge my customers a per-project rate and pay for such mistakes myself, impacting my own bottom line rather than the customer’s. More often, I find out when others point my mistake out to me. From the perspective of time and money, this is the least costly of these two paths, yet it is the one that I have always dreaded more. Why? Because the price is paid in self-confidence, which is a far more precious resource than time or money. Either way, there is a price to be paid for being wrong and it’s very easy to get into the habit of simply standing by what I’m most certain of. If I don’t take any risks, then I won’t pay for taking them, right? Well, yes… but stagnation is an even more expensive currency than confidence, time or money. Being wrong costs, but mistakes are how I learn to be better at what I do. Any price paid for mistakes made is an investment, so long as I learn from the error. Sometimes the investment is disproportional to what has been learned, but that’s the nature of most investments. The key is to find a way to get the maximum return. Over the last few years, I have been involved in social media and a few support forums such as Experts Exchange and, more recently, the Cisco Support Community. It feels good to be able to help a bit with what I know. It feels even better when I step out on a limb, get called out when I’m wrong, and have the opportunity to engage in a discussion where all of the participants hash things out and learn in the process. It wasn’t this way at first. Initially, being corrected publicly made me very defensive. It was difficult to face how much I didn’t know when I had spent years developing expertise. This reaction subsided after a bit. Though it never truly went away, it began to be tempered by an appreciation for how much more there was to learn. A few weeks ago, a few of the people I follow on Twitter posted a cool little graph that outlined my thinking perfectly. 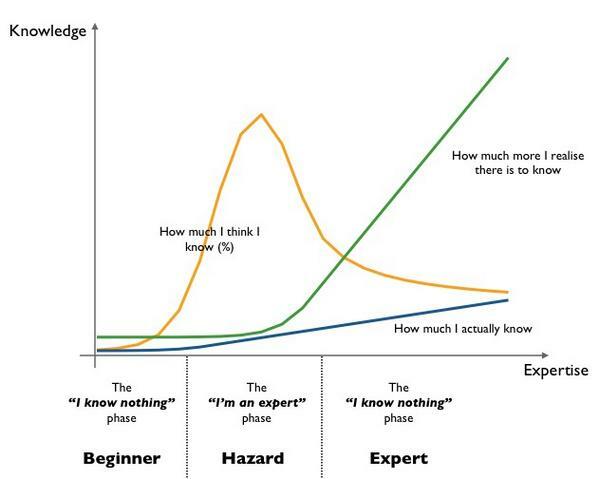 I’m sure the original point of the graph was to illustrate how dangerous the person who thinks they know more than they do actually is, but I was more inspired by the last part of the graph where there is a realization of the unlimited learning opportunities ahead. Having a community, whether based on mainstream social media like Twitter or more formally-organized support communities, gives me a place where it’s okay to be wrong. With a little bit of ego-swallowing, there’s a lot to be learned by throwing ideas out there and listening to why people think they’re great or why they think I might be partaking of radical hallucinogens. Either way, I’m going to keep at it and learn from the process, right or wrong.